“Riding on Duke’s Train” introduces young readers—and older ones, too—to a world of magic, not one of wizards and werewolves, but of music, specifically the jazz of the 1930s and ‘40s: the jazz of the incomparable Duke Ellington. Mick Carlon’s new book, just published by Leapfrog Kids of Falmouth, provides an intimate look at Ellington, his music and composition style, his personal life, his band members, the ups and downs of the lives of traveling musicians, and race relations in the 1930s, and the coming of World War II, told through the eyes of a child. In “Riding on Duke’s Train,” 9-year old Danny, who has recently lost his grandmother, the only parent he has ever known, meets Ellington when he climbs aboard his train one night in 1937, unaware of whose train it is. Gracious and friendly, Ellington and his band members not only welcome him aboard, but buy him clothes, and give him a job helping to carry instruments and polish the drum set. Danny grows up with the band, developing a love of reading when cornet player Rex Stewart shares his books with him, and an ability to copy the music that Ellington composes and write out parts for the players. He also learns how to play the trumpet, inspired by the virtuosos around him. But what Danny does best is give the reader a warm, intimate, and inviting introduction to Duke Ellington, pianist, composer, big band leader, and major influence on the development of jazz. Born in 1899, Ellington composed 2,000 pieces of music between 1927 and 1974, up to the day he died, at the age of 75. 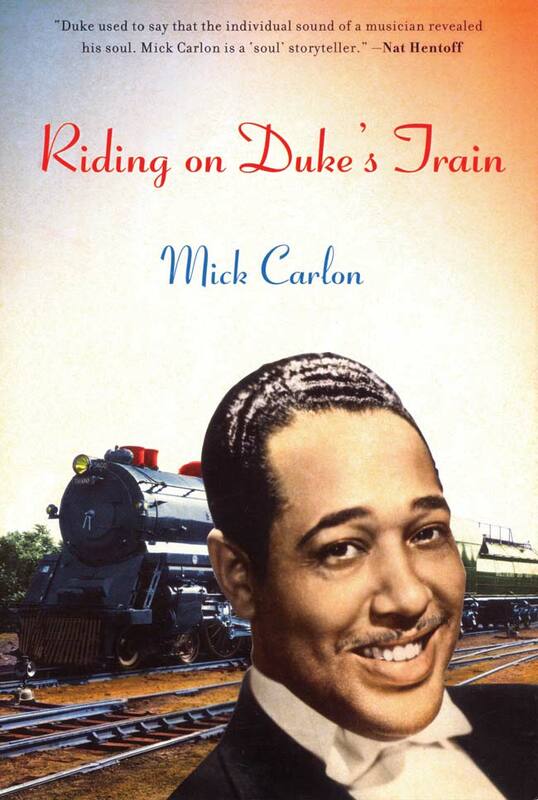 And, as Mr. Carlon points out in “Riding on Duke’s Train,” he did not just write music that moved him, he wrote for the specific talents and strengths of his band members, all of whom we get to know through this book. It is hard to read this book without putting on an Ellington CD or finding exactly the song Mr. Carlon is writing about on YouTube, and listening, appreciating the music on a new level. And I think that is just what Mr. Carlon had in mind when he wrote the book. The book also reveals a lot about the world Ellington lived in, the racial discrimination he faced in this country, the adulation of European fans, and the growing realities of Nazi aggression. We also learn about Ellington’s compassionate nature, his humanity toward others, his enjoyment of fine clothes, and his fondness for a game of poker. The language is easy for young students to understand, and uncommon words or concepts are clearly explained. These comments are especially meaningful to Mr. Carlon because Mr. Hentoff has always been one of his journalistic heroes. Mr. Carlon, who was 15 when Ellington died, never knew him personally and he is not a musician himself (his attempts at playing saxophone, trumpet, and guitar were not successful, he said), but jazz is an important part of his life, and he has spent, he said, 30 years studying Ellington. Jack Bradley, a jazz expert who lives in Harwich, did know Ellington. He was Louis Armstrong’s road manager and chief photographer. Armstrong called him “my white son.” Mr. Carlon interviewed Mr. Bradley for the book, and, when Mr. Bradley read it, he said, “The Duke Ellington in this book is the man I knew. This is Mr. Carlon’s first book. A resident of Centerville, he is an English teacher at Barnstable Intermediate School with 27 years of experience in teaching, including 19 years as a journalism teacher at Barnstable High School. A lifelong jazz fan, he uses jazz in the classroom to put literature and world events in context. In the course of his teaching, he has created many young jazz fans. Both of his daughters—Hannah is 15 and Sarah is 12—play piano, and Sarah also plays saxophone and violin. Barnstable Intermediate School will be using the book in its 6th grade classrooms next year, and Mr. Carlon has made a 12-song CD for them to listen to as they read. Bridgeport, Connecticut, schools are also going to use the book. Urban schools are interested in the book, Mr. Carlon said, not only because it is about Ellington, but because it has strong African-American characters. A number of other schools are looking into incorporating the book into their curriculum. Mr. Carlon is currently revising his next novel (which he actually wrote before “Riding on Duke’s Train”). It is called “Little Fred and Louis” and is about Louis Armstrong in 1959 and 1960. And he is thinking about a third book. Author Mick Carlon will be at Titcomb’s Bookshop tomorrow, December 10, at 2 PM to sign copies of his book, “Riding on Duke’s Train.” The bookshop is at 432 Route 6A in East Sandwich. Call 508-888-2331 for more information.